I first read this book back in November 2011. Although I know I really enjoyed it, I'd forgotten most of what happened in the story. This was probably a good thing from a re-reading point of view, since I was surprised by some of the twists the story took, although I remembered the main plot points. I think overall my feelings are not much changed from the first time I read it (so it has stood the test of time for me fairly well so far). The heroine of this story is Gatty, a fifteen-year-old field-girl living in the year 1203. After her father's death, she is given the opportunity to become a chamber-servant to Lady Gwyneth de Ewloe, raising her position in the world. This leads to the chance for her to travel to Jerusalem when Lady Gwyneth decides to go on a pilgrimage there. (Although I have described it as an opportunity, Gatty isn't given much choice in any of these matters; she has to go along with what is decided for her by her superiors.) In the Middle Ages, journeying from England to Jersualem is a fairly major undertaking; the entire journey takes almost a year to complete, there and back. So it's a pretty big deal, and Gatty grows up a lot and learns a lot about the world, and herself, on the way. As she reflects towards the end of the book, she is "the same, but not the same". I liked Gatty a lot as a character, and she definitely grows and develops throughout the story. The developments of her relationships with the other characters, particularly Lady Gwyneth (who is like a mother figure to her) and Nest (Lady Gwyneth's other chamber-servant, who is very different from Gatty and initially dislikes her, but they come to like and understand each other better during the story), are also very well done. I like the concept of a journey as a plot device, as a chance for self-discovery. The journey itself is interesting to read about, as there are a number of problems and difficulties to overcome, and not all of the pilgrims make it to Jerusalem. Quite a few things happen on the journey; thieves, unscrupulous tradesmen, dangerous terrain (such as riding along the edge of a precipice), and various other dangers and temptations, and there are times when it looks as though everything is lost - but all comes right in the end. 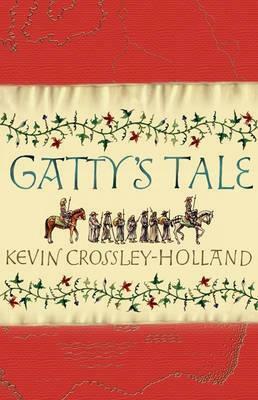 Naturally, we also learn about life in the 1200s, and see the sights of medieval Europe along with Gatty. The writing is also very good, and the ending of the book is just about right too. Although overall it is a slightly bittersweet book, in which bad things do happen, there is enough good in it to outweigh the bad and to finish with a happy ending. This is technically a sequel to the author's Arthur trilogy, which it would probably be helpful to read first, but you definitely don't have to have read it. (I did enjoy it overall, but not as much as this book.) It has also been published under the title Crossing to Paradise. Find it on Goodreads here.